Wanda L. Bonham, 95, of Bloomville, completed her life’s journey with her son by her side, Oct. 21, 2017, at her home. Wanda was born Jan. 29, 1922, in Scipio Township, Seneca County, to Harry and Nancy (Tusing) Chaffee. On May 6, 1944, in Tiffin, she married the love of her life, James A. Bonham, and he preceded her in death April 3, 1995. Survivors include a son, Terry Bonham of Bloomville; eight grandchildren, Lisa (Bonham) Nalle, Brian, Sarah and Jason Bonham, Austin and Cody Smith and Ashley and Brian Hammer; six great-grandchildren; a brother, Ronnie (Ann) Chaffee of Bloomville; several nieces and nephews; many local children who spent time with “Aunt Wanda”; and friends and church buddies, Janice and Ray Weasner and Ann Minzer. She was preceded in death by her parents; her daughter, Judith “Judy” Hammer; three sisters, Leona Hart, Arlene Kirkwood and Wilda “Billy” Kirk; two brothers, Dorsey and Edwin Chaffee; and a nephew, Jerry Kirkwood Widman. 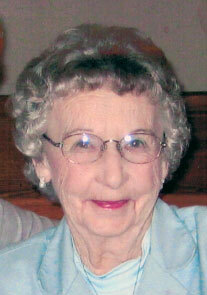 Wanda was an active member of Grace Baptist Church, Tiffin, and had attended services regularly until two weeks ago. She also was a member of Caulfield American Legion Post No. 434 Ladies Auxiliary, Bloomville, Daughters of America, “Kitchen Kids” Kazoo Band appearing in many local parades, and an excellent country cook that enjoyed collecting lots of recipes. She was a vibrant, “feisty” woman and was a formidable dartball player earning many trophies. Her funeral will begin at 11 a.m. Thursday, Oct. 26, 2017, at Lindsey-Olds Funeral Home, 3085 S. SR 19, Bloomville. Burial will follow at Woodlawn Cemetery, Bloomville. Visitation will be 4-7 p.m. Wednesday, Oct. 25, 2017, at the funeral home. Thoughts and prayers for the family may be left at www.lindseyoldsfh.com.